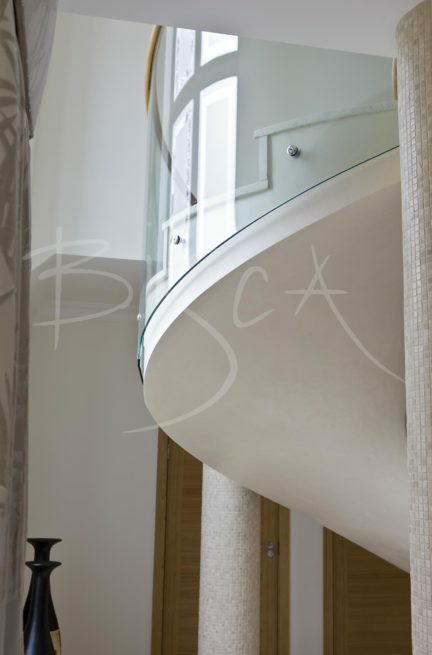 Curved Staircase of Stone & Glass. 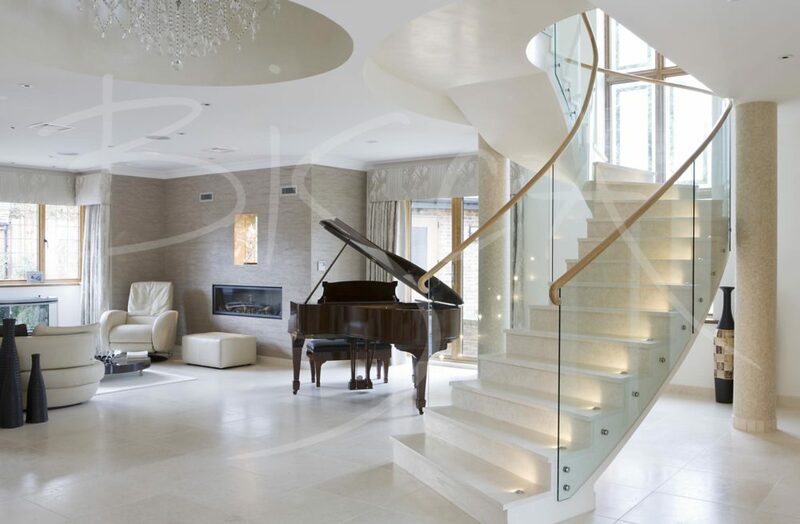 A curved staircase design with feature lighting and glass balustrade. 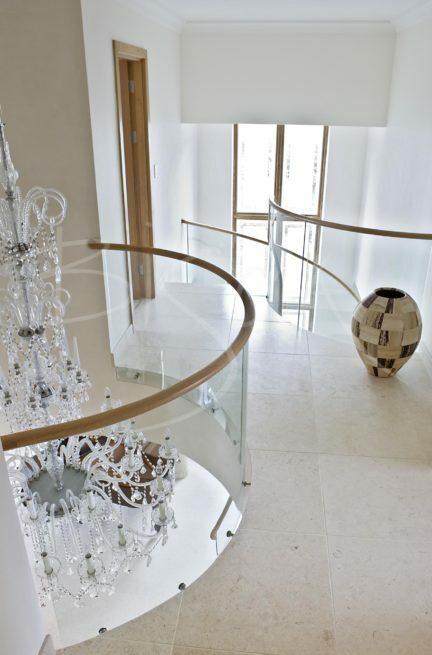 The clients called us in when their builder’s cast concrete staircase had gone wrong. He cast the stair, but completely overlooked the need for a balustrade. The client did not want the upheaval or cost of removing the concrete and starting again. Our only option was to take a chunk out of the ceiling soffit to make space for the balustrade. 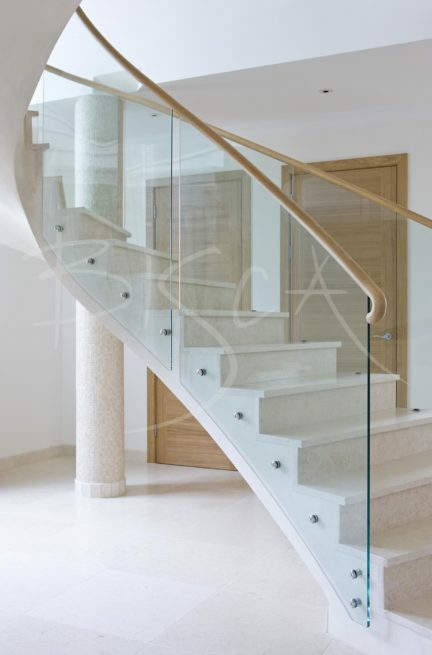 The glass balustrade has hockey stick Oak handrails which are both slim and contemporary. Handrails run up the staircase, round a pulpit style landing, before continuing to upper galleries. We do not recommend cast concrete stairs for many reasons. When comparing costs of a steel vs concrete stairs on paper, the concrete staircase is the PERCEIVED cheaper option. In reality, and in the majority of cases the opposite turns out to be true. Problems encountered on site when a concrete stair goes wrong can be very costly to put right. Concrete staircases can never have the elegance or finish of a steel staircase. If you want a curved staircase design or glass balustrade, based around this project or materials, please mention reference 2169.